WattHead - Energy News and Commentary: What Can the US Do in 10 Years? 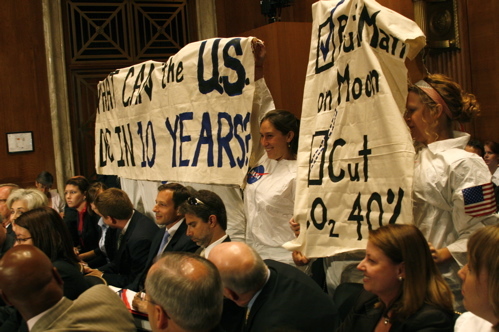 I was one of 7 Astronauts who stood up in today's EPW senate hearing to deliver an unmistakable message to our senators, both allies and obstructionists: be as bold as the Apollo mission. 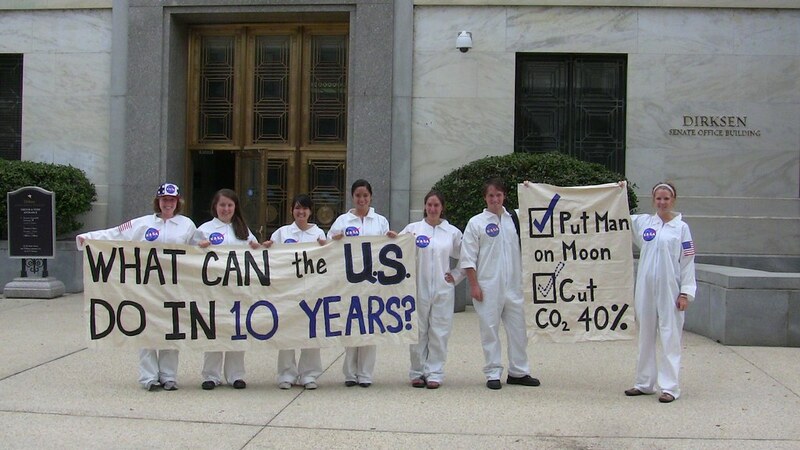 Fully clad in space suits complete with the NASA logo, the Avaaz Action Factory stood up in the middle of the hearing and unfurled our banners. "What can the US do in 10 years?" The first banner asked. "Put a man on the moon (check); cut co2 40% (dotted-line-check)." said the 2nd. Responses in the room ranged from excited smiles and laughs to uncomfortable grimaces. Senators Boxer and Sanders didn't reach for the gavel to call for order. A confused capitol police officer kindly asked us to sit, but didn't kick us out. After 15 minutes, another officer asked us into the hallway but let us back in after a warning. Walking in and out of the hearing twice only added to our visibility because of the bright and shiny NASA suits we all had on. Once we were let in a second time, we stood up on the benches in the back and raised the banners even higher. While that resulted us being escorted out of the building (it was time for a nap anyway!) it also resulted in more comments by the senators and staff. Senator Klobuchar (D-MN) thanked us and repeated the message almost word-for-word. Bob Kiss, mayor of Burlington, thanked us for our antics, before laying out Burlington's success at reducing emissions and creating jobs. And to me it seemed we put smiles on many other young people wearing suits and working more 'serious' jobs who wished they could have joined us. Young people were inspired by the Apollo mission, and it changed a generation. I want something that ambitious to strive for, to work for and to build my life around. I'm 25, and I've been working on climate change solutions/policy for 3 1/2 years since I realized this wasn't a time to count on 'somebody else'. I'm young, but I'm not getting younger, and 2020 is looking closer and closer. I'm getting worried about what's going to happen if we don't have serious cuts in emissions by then. Cutting carbon 40% by 2020, and all the other equally bold provisions needed for a truly solutionary climate policy, would be massively transformative, and that's just the point. I'm not working for small solutions and a don't-rock-the-boat economic poicy, as some law-makers to call for . We didn't get to the moon by upgrading toasters and squabbling about the best kind of space helmets. We got there by embracing new industries and technology, as well as a national commitment to a goal. I want to watch out country catch a fever of innovation. I want to bring out the best in this country, because nothing less will do. Read Henry Waxman: "As with the space program, this new mission will revitalize our economy, create jobs, and spur research, development, and innovation." Or check out Adam Siegel of Get Energy Smart Now: When it comes to the challenges before us (the US and the globe), the Apollo analogy is a powerful one — the idea of a President setting an objective and a massive endeavor being put together to achieve something many thought impossible on an, well, impossible timeline. To take the United States from what seemed to be a position of disadvantage to one of advantage, to ‘win’ the space race. Many concerned about America’s economic challenges, our energy problems, and the looming catastrophes of global warming look to the Apollo Program for inspiration. From the eloquent power of Apollo’s Fire to the strong organizational power of The Apollo Alliance, there is an intense power to the appeal to the greatness of The Apollo Program’s quite tangible achievements as a model for tackling the very serious challenges before us (both the U.S. and all of us). I'm proud of the work of the Climate Action Factory and our efforts to increase the pressure. Today was a great day for young people trying to figure out how to make an impact inside the beltway. We don't have millions to spend on lobbyists, nor do we have the insider connections or vested interests to get us into certain meetings. Our vested interest is our future, and our resource to spend is our time. What we can do, are doing, and need to do a lot more, is clearly remind our legislators that we are going to continue to increase the pressure on them through the media, through lobbying visits, through local organizing until they get us the policy we want. We don't want compromises; we want climate solutions. And we're going to vote them out of office or run ourselves if our current lawmakers aren't up to the job. The fight for a strong enough climate policy is heating up faster than ever. We're stepping up the action and the stakes here in DC. Can you step it up where you are? What's the next step? making that phone call you've been meaning to make? Asking 10 friends to make the call? Planning an August recess in-district meeting? Donating to the cause? Wherever you fall in terms of experience and engagement, I'm asking you to take the next step. Hey great post! This is awesome! Would you mind if I reposted this over at ACE's blog? Might give our teens some ideas for action... Please let me know, thanks!